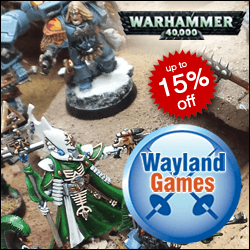 Drop pod lists and armies are becoming increasingly popular armies with Space Marine players and the Space Wolves are no exception. 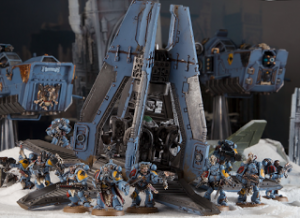 The Space Wolves blog originally published this article on Space Wolves Drop Pod Tactics. That blog and the corresponding facebook page have since been lost to the warp and may never return. In an effort to save this information we have republished the article by Adam Smith and left it exactly how it was. The reason I chose a Drop Pod army is because I found it incredibly difficult to get my units across the board without them being shot to pieces or easily countered by faster, more shooty armies. Eldar and Tau players, I’m looking at you. Like any army list, it then took some fine tuning. 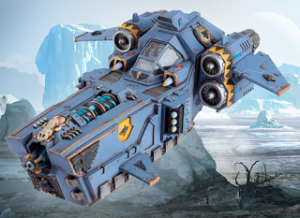 Spamming Grey Hunters wasn’t the solution and I needed some of the new units with high strength and high durability to keep up with the current Meta – In this instance, 2 of the new Berserker Dreadnoughts. But I also needed Melta guns – lots of Melta guns! The Grey Hunters are great for this, because they can keep firing their Melta guns turn after turn. Meanwhile the Wolf Guard with Combi-Meltas are a one-hit-wonder, for when you absolutely need to take down something big and nasty in a single strike. Ulrik The Slayer is in there, along with a Wolf Standard to give all those infantry Preferred Enemy – especially the Wolf Guard whose Combi-Meltas absolutely NEED to hit and wound whatever they are shooting at on the turn they arrive. The Dreadnoughts act as blockers to take a lot of hits and herd the enemy together for the rest of the Space Wolves. But, they also engage enemies which may struggle to hurt them with the intention of holding up vast enemy numbers. But they’re no slouch against either units in close combat where their Strength 10 Attacks can make a massive difference. Statistically (if you’re a little bit lucky with your 3++ Invulnerable Saves) a single Berserker Dreadnought could take down an Imperial Knight in close combat. Let that sink in for a moment. Especially when I’m running 2 of them. Finally, the Stormfang flies in for long ranged heavy weapon support, taking out the targets the Space Wolves on foot cannot easily reach or wouldn’t want to engage up close. But there’s a little more to Space Wolves Drop Pod tactics than this. Because you’ve got to use all these units together and maximise the destructive potential of your Drop Pod Assault. You’ve got to decide which of your units will go into the first wave of your Drop Pod Assault and arrive on Turn 1 and where you will place them. These two decisions will be what makes or breaks your game. They determine whether your first wave smashes their target and establishes a foothold for the rest of your force, or whether they ‘bounce off’ the enemy force, leaving your forces vulnerable and creating an uphill struggle for the rest of the game. As you can imagine, it’s a nerve racking decision which only gets better with experience by playing lots of games. Although if you have a very sporting opponent, they may give you some help in deciding what to place when, where and why to help you learn. 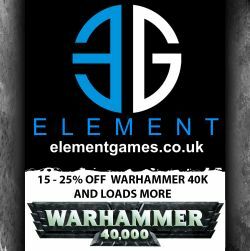 2 Extra Grey Hunters, Melta gun, 6 Close Combat Weapons, Wolf Standard, Wolf Guard Pack Leader upgrade, Terminator Armour, Storm Shield, Combi-Melta. I could choose to throw down 3 units of Grey Hunters and a single Elite choice. Either a Dreadnought or the Wolf Guard and try to get the maximum number of feet on the ground. Units in Reserve would then support the mass of bodies already on the board. I could choose to throw down Ulrik’s Grey Hunters, the Wolf Guard and 2 Berserker Dreadnoughts. This is a much smaller Drop Pod Assault force. But if Ulrik and the Wolf Guard land close together, the Wolf Guard can benefit from his Preferred Enemy ability (he has a 6″ radius on this) to re-roll 1s to hit and to wound with their Combi-Meltas. Meanwhile the Dreadnoughts are placed to hold up the enemy elsewhere or reinforce Ulrik’s Grey Hunters and the Wolf Guard. No one really wants to get too close to these 2 Dreadnoughts if they can help it! However, the biggest issue with the Dreadnoughts is that they are not effective on the turn in which they arrive, because they cannot charge and they have no shooting attacks. Placing them in your Turn 1 Drop Pod Assault is the most effective way of getting them into play, because they can move into position before the enemy start taking control of the board. Then they can charge in Turn 2, because the enemy usually won’t charge them. The problem is if you keep them in Reserve… because by the time they do arrive, you’ll need to wait another Turn until they can charge. By then the battle may already be well under way. This is why you have to choose your first wave so carefully. But it’s ultimately a simple choice between numbers of troops and elite units. Pick one with confidence and go for it! The Elites heavy first wave is for smashing things and establishing a strong foothold. The Troops heavy first wave is for claiming objectives. Just remember to “match” the units in the first wave of your Drop Pod Assault with enemy units that they can hurt, or may struggle to hurt them in return. This is especially true for the Berserker Dreadnoughts. 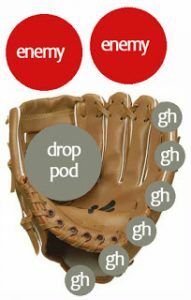 Okay, it’s time to share what I call the Baseball Glove deployment with you guys. It’s called this because we’re going to use a Drop Pod as a palm and a pack of Grey Hunter as the outside finger to effectively ‘catch’ another Drop Pod that’s arriving on the same Turn. I used this to great effect in a game against some Imperial Guard. I knew I needed to blow up Pask’s Leman Russ Punisher on Turn 1. I had Ulrik’s Grey Hunters and a pack of Wolf Guard in my Turn 1 Drop Pod Assault. So I placed Ulrik’s Drop Pod first, rolling for scatter and it landed not too far away from Pask’s Leman Russ squadron. Because you can disembark within 6″, this allowed me to place the Grey Hunters far enough away from the Drop Pod to create a line of models (with my Melta guns close enough to the Leman Russ tanks to shoot this turn of course). Now, when my next Drop Pod with the Wolf Guard in needs to land, without scattering too far off target, I place it to the left of the already landed Drop Pod. If the Wolf Guard’s Drop Pod scatters, it will be likely to land on the enemy tank, the landed Drop Pod or the Grey Hunters. Thus, it effectively ‘bounces off’ these barriers and lands in an open space. This stops the Wolf Guard Drop Pod from scattering too far away. Sure, it could scatter to the left, but I had measured and ensured they would still be in range to hit Pask’s Leman Russ from the side. However, should it scatter to the right, there is an effective net/glove in place to ‘catch’ their Drop Pod roughly where I want it. Obviously, you may want to avoid this if you opponent has lots of big high Strength, low AP blast weapons. But it can work very well. I always place the Blood Claws in Reserve. No way are they going to do much on Turn 1. They’re cheap reinforcements/objective grabbers. Obviously, the Stormfang must go into Reserve. But, whatever you don’t place in your first wave, you have to roll for from Turn 2 onwards. All of these Reserved units will be needed to reinforce your first wave. So don’t be tempted to split off units, you need to get your units to work together rather than go it alone. After all, there’s nothing quite as intimidating as a massive pack of howling Space Wolves all advancing on the enemy. It also means that while one of your Grey Hunter packs charges into close combat, the enemy can be softened up by another unit Deep Striking close by and softening them up with Rapid Firing Bolters and Melta guns. So there’s lot of synergy to be had in using your Reserves to Deep Strike units exactly where you need them to wipe out enemy units. And don’t forget that in a Combined Detachment like this, all Dedicated Transports of Troop units are get the Objective Secured ability. So you can try and land a Drop Pod on an objective (they’re pretty darned big!) and disembark your unit to go and kill the enemy, leaving the Drop Pod to hold the point. With 7 Drop Pods in this army, there’s a lot of units that can grab objectives. And don’t forget that every Drop Pod comes with a Storm Bolter. Because they’re all fairly tall transports with a 360-degree field of vision, you can focus all that firepower on a single enemy unit per Turn. That’s 14 BS4 shots! Running a Drop Pod army has been brilliant so far. Turn 1 deployment is tense and challenging, but when it goes right, you make a sizeable dent in the enemy army before they can even react. I’m a big fan of the ‘alpha strike’ philosophy, which is to damage the enemy army substantially before they can damage you. Just be careful that your Turn 1 Drop Pod Assault isn’t overwhelmed by the enemy who will outnumber you and have more points in play. You want to keep stacking the casualties on their side so that the battle goes in your favour and not end up facing down their 1,750pts with just 750pts from your first wave of Drop Pods. But like all things with this game, getting good comes with practice and playing a lot of games against a wide range of opponents.